Local English-speaking guide only for 3 hours. For the possible visit of the cloister of the Monastery of Santa Chiara, the tickets are not included. Wander through the narrow alleyways of the Spaccanapoli, one of Naples' poorest quarters where the daily lives of the Neapolitans unfold like a play. Sometimes comical, sometimes tragic, but never boring. You'll discover the true soul of the city as you explore the hidden Napoli. 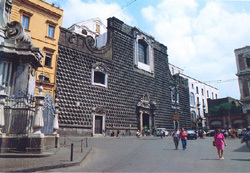 Visit the elaborately decorated Baroque church of Gesù Nuovo which is considered to be the historic heart of the city of Naples . Living under the shadow of Vesuvius, the Neopolitans are very religious people and are particularly found of the city's patron saint San Gennaro. While visiting the Duomo, you'll hear of the miracle that takes place in Naples every year on the saints birthday when his dried blood contained within sealed vials liquefies as the devout Neopolitans offer prayers to his memory. 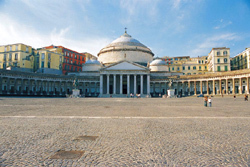 During your time in Naples you could also visit the photogenic San Gregorio Armeno and enjoy views of the bay and perceive how Naples rests like a great amphitheatre around waters of the bay of Naples.